We compare the new Renault Kwid 1.0 in a detail spec comparison with the competition, the Maruti Suzuki Alto K10 and the Hyundai Eon 1.0 Kappa. The most affordable cars on the market currently in India are the Kwid the Alto and the Eon. But for the one who want a little more ‘umph!’ for their money, they had a choice of either the Alto K10 or the Hyundai Eon 1.0. Now Renault has jumped into the mix after their Kwid with its 800cc engine took the country by storm. We take a closer look at how the new 1-litre Kwid fares against the competition in a Tech Spec comparison. When it comes to size, the Kwid is significantly larger in length and width compared to both the Alto and the Eon. But its slightly shorter than the Eon which gives it a better centre of gravity and better handling. The Kwid also has the longest wheelbase in the segment which results in more room in the cabin. However, while the Alto K10 has a 35-litre fuel tank and the Eon has a 32-litre tank, the Kwid has to make do with a smaller fuel tank capacity of 28-litres. Taking the standard 800cc engine, Renault has increased the size of the bore and given it a longer stroke which has resulted in the increased the displacement capacity of the engine to 999cc. All three cars essentially have the same displacement from their three-cylinder petrol engines and come mated to 5-speed manual gearboxes. However, the Eon is the one that has marginal edge over the Kwid and the Alto by being slightly more powerful and generating a litre more torque that kicks in at lower rpms when compared to the other two. 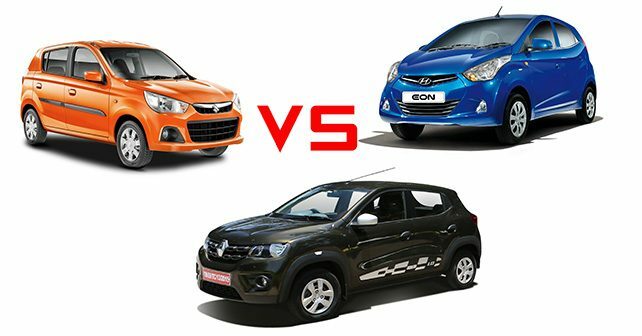 But the Hyundai engine is an SOHC 9 valve engine, while the Kwid 1.0 and the Alto K10 both are 12 valve DOHC engines. The Kwid, the Eon and the Alto K10 all come with industry standard MacPherson Strut front suspension. However, the Kid and the Eon both come with Torsion/twist beam rear suspension, while the Alto has a 3-link rigid axle at the rear. The Alto also has the edge by offering ventilated disc brakes at the front as opposed to Hyundai and Renault offering solid Discs which can tend to over heat. All three cars only offer rear drum brakes as standard. The Kwid has the widest tyres while the Alto has the thinnest. While thicker tyres will provide better grip in the road for a better manoeuvrability at speed, the thinner tyre will reduce rolling resistance and result in better fuel economy. As safety equipment is still not mandatory in cars in India, but the marginally growing demand and awareness for safety equipment has improved in the country. However, in this segment while the vehicles have been engineered to be as safe as they can be in the evnt of an accident, none of the vehicles some with additional safety features as standard. The only option in all three vehicles is a driver airbag while all three vehicles don’t not even get anti-lock brakes. In the small car segment, the over all package is key for success. Which is why manufacturers try their best to throw in as many features into the cars they can. Important Equipment like Power steering, Power Windows, Remote central locking, are all provided in these cars, but some of them are only available in the higher variants in the Alto as it has multiple trim levels to chose from. While all cars seat 5 people and have fog lamps and 12-volt power outlets available, it is the Kwid that edges past the other two as it in the only car in the segment with a touchscreen infotainment system with in-built navigation. The Kwid due to its dimensions and design its also has the most spacious cabin and the largest boot space in the segment. The Kwid is available in the top two RXT and RXT (O) variant which comes with all the features loaded as standard and is priced only Rs. 22,000 more than the 800cc engine version fro both trim levels and is still priced under Rs. 4 lakhs. On the other hand, the Alto K10 starts at a lower price than the Kwid for the lower model, and reaches above the Rs. 4 lakh mark. The Hyundai Eon 1.0 Kappa is way more expensive with prices starting above Rs. 4 lakhs. With the most amount of interior cabin and storage space, and well packaged features, it is the Renault Kwid 1.0 that seems to be the best value for money vehicle in the segment now, because of its pricing. *All Prices are ex-showroom Delhi.